I can’t remember if I have written about it before (when commenting on Tech construction) the Fifth St. Bridge over the connector is an incredible conversion. When I started at Tech it was a two lane road with immediately adjacent sidewalks and high-reaching chain link fence that kept you from throwing stuff into the mess of traffic below. Now it’s a park where you have no idea that 10 lanes of mayhem are pulsing below you. 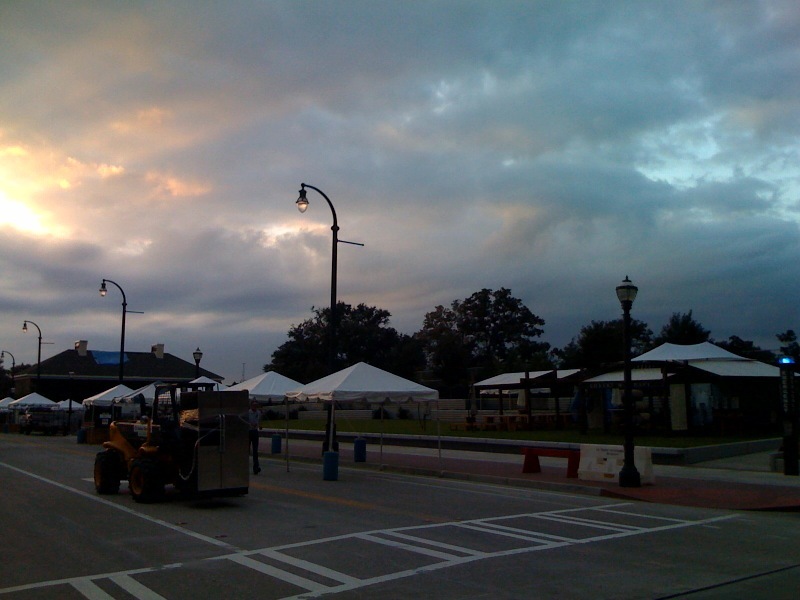 This weekend the piece of road solidifies its transformation as it hosts the annual Taste of Atlanta event. This will be a formal acknowledgment of the bridge’s role as a place to gather and for leisure and not just a path between destinations. The transition has been progressing for awhile now (see flag football above). Two days ago I noticed a Robert Mondavi faux chateau set up on the grass, and yesterday when i was walking to the train the tent city was in full swing. This morning on my way in the setup was continuing and in front of the main stage there was a cooking segment being shot for the local news stations. This weekend hundreds, if not thousands, of people will be standing on it, enjoying foods, and taking in the view of the skyline, with no immediate cognition of the speed, noise and power beneath them. Pretty cool.Belw is the satellite image during the construction (the original width is the street plus the red sidewalk). I wondered about other such bridge projects. A quick google search provided nothing much. Innovative bridge improvements apparently entail “Positioning slabs above the piers to protect from water the “expansion joints” that adjust to bridge movement” and not “throwing a culinary party on the bridge.” Of course this one in Florida is pretty cool. Please let me know if you have knowledge of anything better. 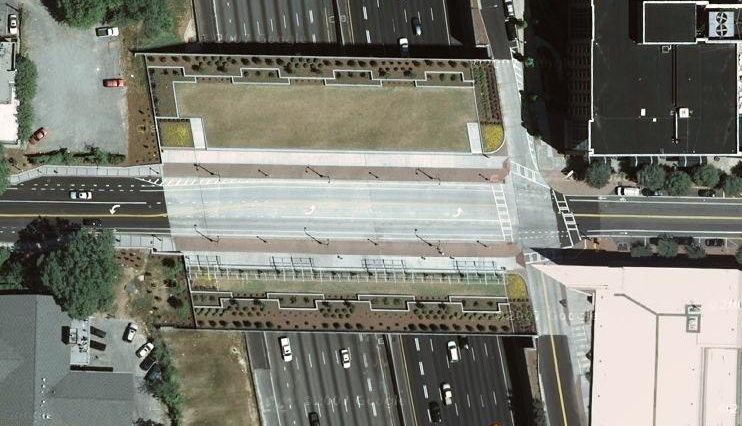 Until I hear otherwise this bridge over a highway is cooler than your bridge over a highway. 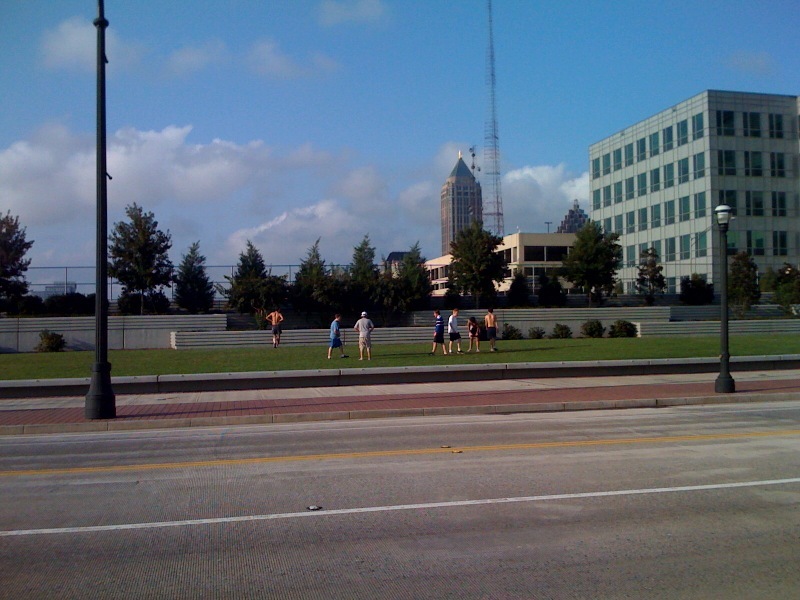 Two places downtown where the connector is submerged and we could replicate 5th St: between Capitol/Memorial and MLK [see http://bit.ly/15FNQz%5D, and between Piedmont Ave and Peachtree St [see http://bit.ly/41oGMd%5D. The one at Capitol is already part of a long term plan between the state and city to create a greenway between the capitol building and oakland cemetery. There are also potential traffic circles at these intersections that would be widened with newly-covered freeway. Think Dupont Circle in DC. Greenspace and mobility in one swoop. Thanks for the updates and the change of perspective. You've shifted this conversation from what exists toward looking for potential sites and imagining what can exist. By the way, the construction bids came in way over budget, so we'll see what we actually end up with.